I wrote a while back about hineni, the Hebrew word for "Here I am." Hineni has become a refrain in my mind. I keep thinking about it and finding more and more in it (pronounced hee nay nee). Right now I am at a 5-day spiritual retreat at the Jesuit retreat center in Los Altos. It's my first silent retreat. We meet once a day with a spiritual director, and have two "presentations" where a leader gives a guided meditation or talk. For me, hineni seems to be the topic of thought and prayer for this retreat. Yesterday I googled it and found a bunch of references to it in the Jewish tradition. I'm sure there's much more. One thing that struck me yesterday is the rabbi in that first search result said that "hineni" means more than just "I am here" or "I am present." When they're taking roll in the Yeshiva there's a different word for "here" or "present," poh. Hineni means "I am here, willing and ready to take on the mission you give me." How's that for a lot to think about?! What does willing and ready mean? What is my mission? I was mulling over the many things that may be coming in my life, to which I am saying I am ready. There's so much that could be coming, that it could be my mission to go through. So often things just come out of the blue, right? Like ALS for my brother, cancer for my friend. Of course there are happy things out of the blue, too, like a bonus from work, or an exciting opportunity. It's a little -- more than a little, a lot actually -- scary to say, "Here I am, willing and ready." How can I know I'm willing or ready when I don't know for what? It makes me think of when our pastor had us all paint a little canvas to symbolize the cover of the book with the story of our lives in it. I drew a curving path with a shining cross around the curve. It was meant to signify that we never know what's coming around the curve, but we always know Christ will be there. So even though it's scary not knowing, it's good I do know Christ will be there, walking beside me every step of the way. Holding my hand. Like the friend that he is. 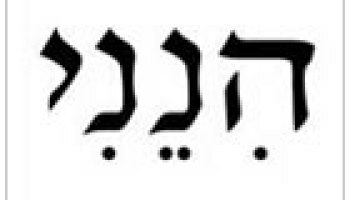 Hineni in Hebrew. I think if I ever got a tattoo, this would be it.